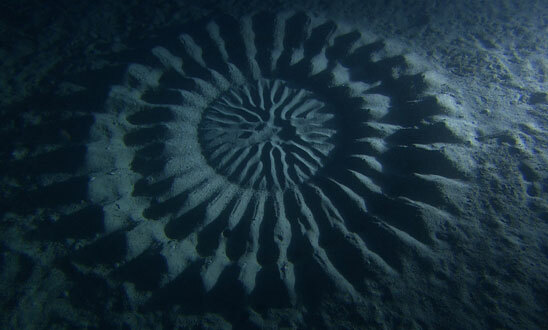 Giant Sea Circles! (and other mysteries) | Sarah Explains! The tiny male fish, as revealed in a Japanese broadcast last week, was caught on camera building and decorating the structure to attract a mate. The eggs laid in the middle have east access nutrients (the shells) and are protected from currents (by the grooves). Q: Why does that crow hate you? Q: What the hell are you trying to draw? A: I don’t know, that doodle is terrible, but your ipod app might: Brown University and the Technical University of Berlin have taught a computer to identify doodles by feeding it several sample drawings from users across the internet, and offer a free app that guesses as you draw. It’s pretty good–even though it identified my angry face as a donut. Can’t all be winners. Q: How do you make the Eiffel Tower look smaller? Why is hair turning green in one Swedish town? How do you model the bounce of a ponytail? How do you keep your patients from exploding? A: Ask the 2012 Ig Nobel winners (check out the list at the bottom of the article!). The award, given in September, acknowledges research that “first make people laugh, and then make them think,” according to Nature. These bizarre results coming from serious research are showcased at the Harvard ceremony–providing the ultimate answers to questions you never asked. Happy long weekend, and may all your answers be questioned. This entry was posted in Science News and tagged crow, doodle, ig nobel, mysteries, puffer fish. Bookmark the permalink. Thanks! I’m glad you enjoy it!